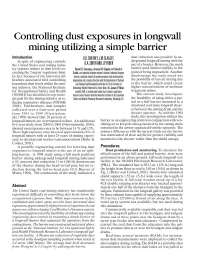 The United States coal mining industry has traditionally experienced difficulty in controlling dust levels below the occupational exposure limit. While improvements in face ventilation and water spray nozzles have decreased dust exposures, approximately eight percent of experienced coal miners are still developing Coal Workers Pneumoconiosis. This investigation tested the feasibility of enhancing existing engineering dust controls by mounting a simple barrier on a longwall shearer that separated the operators from the cutting drums. The barrier was constructed and tested above ground at the National Institute for Occupational Safety and Health Pittsburgh Research Laboratory longwall gallery test facility. A 96-percent reduction of respirable dust occurred at the headgate sampling position when tested at 2.4 m/sec (480 ft/min). The average dust level decreased from 39 mg/m3 to 1.5 mg/m3 by utilizing the barrier.